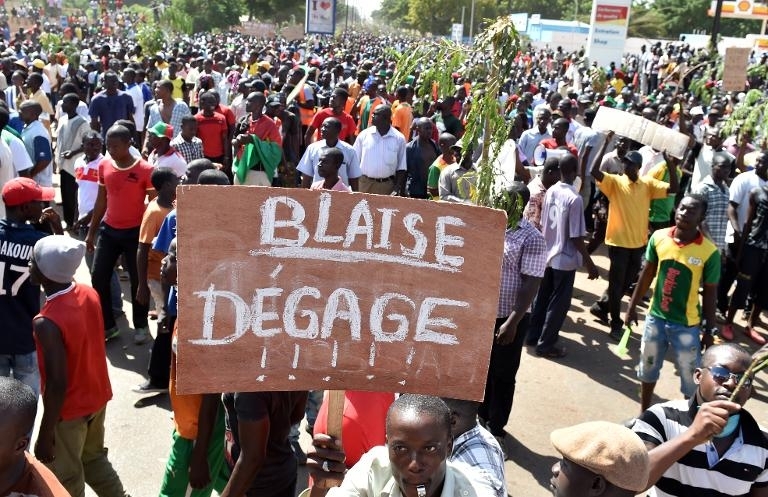 Demonstrations in Ougadougou that brought an end to Blaise Compaoré’s 27 years in power. The removal on 31 October of Blaise Compaoré, who was president of Burkina Faso for 27 years, following street protests, has been welcomed as a momentous event. In a continent where state leaders often desperately cling to power until their death or they are removed through violent force, the “˜Burkina revolution’ has been hailed as an all too rare case of how citizen mobilisation can successfully produce regime change. The protests broke out over plans by Compaoré to change article 37 of the Constitution which limits presidential tenure to two five-year terms, enabling him to run again in the 2015 elections. While popular opposition to an extension of Compaoré’s stay in power was expected, the rapidity with which it escalated and resulted in his departure took many by surprise. Street protests against the regime are nothing new: various demonstrations took place in Ouagadougou and Bobo-Dioulasso in July 2013 against rising living costs and the proposed creation of a Senate, while demonstrations against the planned constitutional revisions were organised by the opposition in January and May 2014. Compaoré also survived a wave of protests in 2011, including a violent army mutiny. This time though, he seems to have overplayed his hand. The exact nature of the negotiations which took place behind closed doors, and the kind of promises (or threats) that were made to Compaoré that made him bow out so quickly are not known. Similarly, only time will tell to what extent some of the events may have been pre-planned. First, the mass defections in early 2014 of high-ranking members from the ruling party (the Congrí¨s pour la Démocratie et le Progrí¨s, CDP) and their creation of a new opposition party (the Mouvement du People pour le Progrí¨s, MPP) dealt a severe blow to Compaoré. While discontent and dissension within the ruling party had been brewing since 2009, the defections represented the final consummation of this internal schism and brought to the fore Compaoré’s inability (or unwillingness) to seek political conciliation. The defections did not immediately threaten the CDP’s parliamentary control but did weaken Compaoré’s position politically, making his stay in power after 2015 even more problematic. Another factor was the pressure he faced from external actors to refrain from extending his stay in power. With clear indications from key donors such as France and the US that they would not support Compaoré’s bid for another term in office (despite close military ties with the country) he possessed limited room to manoeuvre. Learning from recent events in Ivory Coast and Senegal, Compaoré may have calculated that his ability to force his stay in power was too small. The most significant factor in explaining Compaoré’s sudden “˜resignation’ was the military’s rapid siding with the opposition and protesters’ demands for the president’s departure. Without the backing of the military, Compaoré knew that he could not retain control of power. His departure may offer for Burkina Faso an opportunity to improve its democratic and developmental performance, but important challenges lie ahead. First is the role of the army. Throughout the country’s history, the national army has played a central political role and acted as the guarantor of stability. It came close to achieving a major tour de force during the current crisis by masking what was a military coup as a military-mediated hand-over of power. This illusion was however unveiled when the army leadership announced it would lead the transition period. This decision was not so much driven by a desire to install a long-term military regime but by political calculations. By taking control of the state leadership after Compaoré’s departure, the military likely sought to prevent the immediate outbreak of bitter political infighting between various groupings and thereby stop the country from spiraling into a deeper political crisis. The move also served to ensure that the army would determine the country’s new leader. The army is deliberately seeking to place itself as a key broker in upcoming political negotiations. This may mean that it remains in power until the organisation of elections, but more likely until an agreement is reached with the political parties for the designation of an acceptable civilian transitional leader. In any case, negotiations about the political transition will have to pass through the military and take into account its preferences if any kind of stable political solution is to be found. The extent to which the army will be able to play its self-proclaimed role of “˜neutral overseer of the political transition’ is put into doubt by the internal rivalries within the army and the political allegiances of some of its top brass. The emergence of Colonel Isaac Yacouda Zida as the transition leader may serve stability in the short term as he commands the loyalty of the best trained, best armed and most (some would even say the only) effective military unit in the country, the Régiment de Sécurité Présidentielle (RSP). Despite his position in the RSP, he is less a supporter of Compaoré than army chief General Honoré Traoré, who initially seized control after Compaoré’s departure, or private army chief of staff Gilbert Diendéré. But his position risks coming under challenge from military factionalism and rivalries. Successfully maneuvering the transition will not only involve managing the army’s weight on political negotiations but also managing the risks of infighting within (and possibly partial disintegration of) the army. Furthermore, the close ties of some senior military leaders to Compaoré pose a risk that the latter will seek to influence future political developments through these military connections. The question of the army should not overshadow another key challenge, namely that of the available political alternative. The political scene in Burkina Faso has traditionally been characterised by a dominant ruling party and a highly fragmented opposition. At present, the two strongest opposition parties are the Union pour le Progrí¨s et le Changement (UPC) of Zéphirin Diabré which won 18 seats in the 2012 legislative elections, and the MPP party created in 2014. So far, the opposition parties appear to have formed a cohesive front but the personal ambitions of key figures such as Diabré and MPP leader Roch Marc Christian Kaboré are likely to put a strain on this. Moreover, ideological differences between parties such as the UPC and MPP on one hand – which are both led by former Compaorists and therefore seen by some as semi-system parties – and Sankarist parties, are also likely to come more strongly to the fore. Managing the aspirations of the diverse factions of the opposition will thus pose a central challenge in the transition process. Because of the political weight of their leaders and the international credibility they enjoy, the UPC and MPP are expected to play a central role in future political negotiations (and/or elections). While the ruling CDP party remained largely silent during the recent crisis and it is as yet unclear if any of its leaders have left the country, it is also likely to weigh on future political processes and retain the support of at least some factions within the army. There is therefore a prospect that the transition in Burkina Faso will amount to a presidential change without real political alteration – the new political elite being drawn from political circles that have operated within the Compaoré system over the past decades. It could be argued that amongst all the available bad options, this might ultimately be the best possible scenario as continuity will promote political stability. After all, in an already unstable region,preventing the implosion of Burkina Faso is highly desirable. However, ‘politics as usual’ will not be enough to guarantee stability unless the key driver of the current crisis is also addressed: widespread popular discontent over socioeconomic conditions. Opposition to Compaoré’s prolonged stay in power reflects the symptom rather than the cause of popular discontent. Since around the year 2000 the country has seen a significant increase in social protests, at both local and national level. This has in part been driven by resentment created by the lag between the high levels of economic growth experienced by the country – driven primarily by developments in the gold mining and cotton sectors – and the limited improvements in the living conditions of the general population. Growing levels of youth unemployment, social inequality, and tensions around the emerging gold mining sector, with industrial mining seemingly producing limited direct benefits to the population while fomenting localised conflicts over land, have proven key triggers of social protests. The extent of this discontent came most clearly to the fore in 2011 when the country was rocked for three months by protests and strikes organised by diverse sections of society – students, civil servants, miners, teachers and even soldiers. This social discontent was compounded by allegations of corruption and economic nepotism within the highest circles of power, with members of the presidential entourage reportedly owning interests in various sectors such as mining, real estate, banking, public works, and retail. According to some reports, such assets were particularly targeted for vandalism and pillage during the recent protests. Failure to address this simmering socioeconomic discontent would seriously hamper any political transition and pave the way for future protests. Dr. Valerie Arnould is Senior Research Fellow at the Africa Programme at Egmont – the Royal Institute for International Relations in Brussels, where she specialises on security, political and justice dynamics in francophone Africa. She is also a Research Fellow at the School of Law, University of East London.